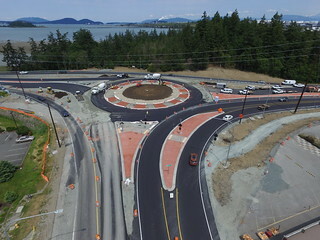 ANACORTES – Crews have opened the final lane of the Sharpes Corner roundabout, 10 days ahead of schedule. Drivers or cyclists using the intersection of State Route 20 and SR 20 Spur will now navigate through a two-lane roundabout enroute to or from the Whidbey Island, Anacortes or San Juan Island areas. Washington State Department of Transportation contractor crews from Tapani, Inc. were ahead of schedule with each stage of construction during this Connecting Washington safety improvement project. The new roundabout opened to traffic Saturday, June 23. Built a roundabout at SR 20 and Miller Gibralter roads. 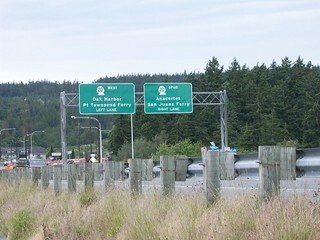 Built a roundabout and two bypass lanes at SR 20 and SR 20 Spur. Added a climbing lane for traffic between the two roundabouts. Added a barrier between the two roundabouts improving flow and safety by allowing right turn only movements. Built a pedestrian and bicycle trail to improve access to nearby businesses and connectivity between US Bike Route 10 and Bike Route 3 – Coast Salish Route. In addition to the visible work to the travel lanes that people driving, cycling or walking will use, crews spent hours improving drainage and upgrading electrical lines through this area. Photos of this work are all available in a WSDOT flickr album. Crews will use a few small lane closures between 9 a.m. and 3 p.m. Monday, June 25 through Friday, June 29, for some finishing work and then will come back to the Sharpes Corner intersection in September to add landscaping and put down permanent striping. Overnight lane closures will happen as part of that work. In July, people driving to or from Anacortes will also encounter two weeks of around-the-clock lane reductions. WSDOT contractor crews from Lakeside Industries will grind down and repave the four-lane section of road between the new roundabout at Sharpes Corner and the roundabout at on Commercial Avenue. This work is part of the project that repaved from Commercial Avenue to the Anacortes Ferry Terminal earlier this year. Those lane reductions will tentatively start Wednesday, July 11. Travelers should pay attention to signage along their route, which will direct people driving or cycling to the proper lane when approaching a double lane roundabout. People entering the roundabout need to look left and yield to anyone already in the roundabout. If the area to the left is clear, travelers can proceed into the roundabout without stopping. Cyclists can use the roundabout as a vehicle would, or can choose to walk their bike through crosswalks at the roundabout. People driving or cycling should give space to trucks, recreational vehicles and other large loads in roundabouts as they may use more than one lane to maneuver. For questions related to rules of the road, using signals or navigating roundabouts, review the Washington State Department of Licensing’s Washington Driver Guide or visit the local DOL office for additional information on driving refresher courses.